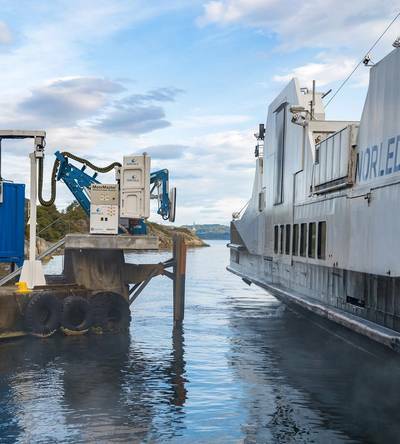 Wärtsilä informs it has tested its automatic wireless induction charging system on a hybrid powered commercial coastal ferry, the first in the world operating with high power wireless charging capability for its batteries. The tests were carried out in Norwegian during the end of August and early September on the 85 meter long MF Folgefonn owned by Norled, one of Norway's largest ferry operators waters. The project, partially funded by Innovation Norway, represents a breakthrough in the evolution of plug-in electrically operated vessels, Wärtsilä said. Wireless charging eliminates the cable connection between the vessel and shore, thereby securing and facilitating safe connections and disconnections. It also reduces maintenance since wear and tear to physical connection lines is eliminated. The integrated Wärtsilä system is based on inductive power transfer and is capable of transferring more than a MW of electrical energy. The Wärtsilä system is designed to maintain efficient power transfer at distances of 50 centimeters between the two charging plates built into the side of the vessel and the quay. According to Wärtsilä, no other wireless charging system is as powerful, or capable of maintaining the transfer of energy at such a distance.